SAN DIEGO — March 10, 2017 — MMC has been retained to handle the national marketing public relations for Dos Almas Craft Tequila, founded by Emilio De Soto, former professional triathlete and owner of the leading San Diego-based triathlon and endurance brand De Soto Sport. The limited-run organic offerings now available include Dos Almas 55 Plata, a super-premium 55% ABV (110-proof), which is made of 100 percent organic Blue Weber Agave, and Dos Almas Cinnamon Tequila Liqueur a 35% ABV (70 proof) made of a young reposado that has been infused with organic Indonesian Ceylon cinnamon sticks and organic pure agave nectar. Originally created in 2014, De Soto’s mission was to defy traditional offerings of other tequila companies by delivering two distinct products on the opposite ends of the tequila spectrum. Dos Almas 55 Premium Plata Tequila has never seen the inside of a barrel and has never been diluted from its original distillation, is characterized by the sweet taste of the agave plant. Pure, raw and artisanal with a high alcohol content of 55 percent, Dos Almas 55 sparks a physical heat and spiritual intensity upon first tasting. Dos Almas Cinnamon Tequila Liqueur is the first sweet cinnamon flavored tequila to be 100 percent natural, gluten free, with no preservatives, artificial colors or flavorings. 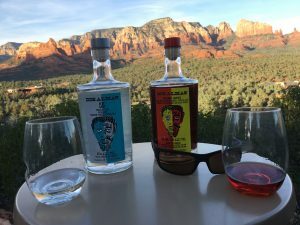 At 35 percent ABV, 70 proof, this tequila tastes hot and sweet with no bite to which perhaps seasoned tequila drinkers are accustomed. Dos Almas Craft Tequila’s new website — dosalmastequila.com — takes readers on a journey to learn how Dos Almas is made, the origin and inspiration for the Face of Dos Almas (“two souls” in Spanish) reviews from experts, where to buy Dos Almas, and how to “Mex It Up” with unique recipes. Dos Almas Premium Craft Tequila Products are created, imported, and owned by Friends Who Surf, INC. (FWS) a federally licensed importer and wholesaler of spirits. FWS is founded by Emilio De Soto. All products are produced in the town of Tequila, Jalisco, Mexico by approval of the Consejo Regulatorio del Tequila. •	Tequila for the true aficionado – 55% ABV, 110 Proof, organic, double distillation, made of 100% Blue Weber Agave, straight from the still. •	Experienced and discerning palates will appreciate the sweet taste of the agave plant by enjoying young tequila, which has never seen the inside of a barrel. Dos Almas 55 is pure, raw, and artisanal; direct from the still, with an alcohol content of 55 percent, nothing added, and nothing removed. Experience this translucent tequila slip through your lips and off your tongue, sparking a physical heat and spiritual intensity. •	If you like cinnamon, or if you have never really enjoyed tequila, this is for you – 35% ABV, 70 proof, made of 100% Blue Weber Agave, a young reposado tequila infused with organic Indonesian Ceylon cinnamon sticks and organic pure agave nectar. •	There are only two ingredients inside the bottle: Cinnamon, and Agave in the form of nectar and reposado tequila. Ours is the first sweet cinnamon flavored tequila to be 100% natural, gluten free, no GMO, no preservatives, artificial colorings or flavorings, with a low glycemic index. This product tastes hot and sweet and has no bite to which perhaps seasoned tequila drinkers are accustomed. We believe that it has the appeal and taste that can help can lead a lot of people who do not enjoy the taste of tequila to really love this new category of spirits made of the agave.